A few weeks ago, the Palmerston Magpies were riding a wave of optimism. On the back of consecutive wins, the Magpies sat with three wins and three losses and a place in the top five. 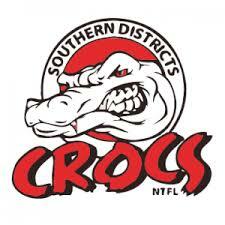 Since then, however, their fortunes have dipped markedly, and their 111-point hiding today to the Southern Districts Crocs has been the worst of three consecutive losses which have derailed their season. The Crocs were awesome and relentless. A fifteen goal first half decided the game, putting the Magpies out of winning contention and setting up a dangerous second half for the ‘Pies. The second half wasn’t as damaging, and could have been better for Palmerston had they kicked straight. But one goal and twelve behinds for the second half killed off any reasonable hope of a fightback. On Saturday, the Nightcliff Tigers held off an alarming charge from the Tiwi Bombers to win by just seven points. The Bombers came into the game riding a wave of three wins in a row. The Tigers lifted and kept the Bombers at arm’s length for the first three quarters, leading by 22 points at the final change. But the rejuvenated Bombers came back hard in the final term, and but for a couple of unlucky posters late might have caught the Tigers. Wanderers, buoyed by last weekend’s win, took the game right up to Waratah on Saturday. Less than a goal separated the teams at both quarter time and the main break. It took a five goal third quarter for Waratah to break the shackles before going on to defeat Wanderers by 27 points. In the process, Waratah helped break a trend that had seen them win just one of their previous four games. The Darwin Buffaloes stayed in touch with the top two teams when they defeated St Mary’s by 11 points. In a game that was tight from the outset, the final quarter was a treat. When young Maurice Rioli kicked a miraculous goal early in the last quarter, Saints got back to within two points and continued to threaten. The Buffaloes rallied with vital goals and withstood a final St Mary’s charge. The win sees the Buffaloes in fourth place, equal with Waratah on points but with a lesser percentage. Saints are now sitting with just three wins after nine rounds and will need to rally. Next weekend will see the Tiwi Bombers host the Southern Districts Crocs at Tiwi Oval in a must win match for the Bombers. St Mary’s will clash with Wanderers whilst the Darwin Buffaloes tackle Palmerston. On Sunday, the Nightcliff Tigers will meet Waratah in perhaps the match of the round as second takes on third.